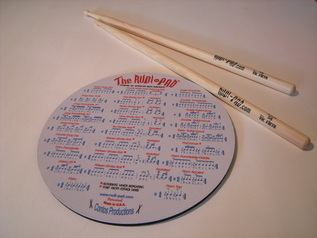 The Rudi – Pad is a machine washable/air dry 8 1/2″ round x 1/4″ thick, durable, flexible neoprene pad with 26 Standard American Drum rudiments printed on the front. Taking it out of the packaging, we were skeptical. A flexible practice pad? But its flexibility may actually be its greatest strength. Because of it, we were able to decide how firm or soft the rebound would be. Want to work on speed? Throw the Rudi – Pad on a pillow and have a practice guide to accompany the burning sensation in your wrists. Want to work on accuracy + control? Put it on a table, counter, or even the floor and it becomes as firm as any other practice pad we’ve tried. After 5 hours of heavy playing it’s shown no sign of wear or tear. 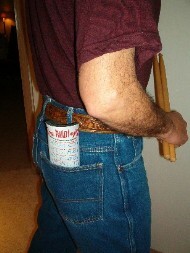 For drummers on the go, the Rudi – Pad fits nicely into a backpack, stick bag, or a back pocket. It can even double as a mouse pad, so you can pretend you’re practicing while surfing the Internet. One knock is that the sticking is only written as right hand leading, so for left hand leads you’ll have to do some mental gymnastics to flip the sticking pattern in your head (go ahead break that “drummers are dumb stereotype”). Overall, The Rudi – Pad delivers exactly what it promises.